The 2015 vintage season at the Foggy Hill Vineyard was a season in two parts. The early growth months of spring were very warm and then it cooled down dramatically in December through the ripening months of summer and early autumn. The heat summation for the Foggy Hill Vineyard for the growing season was 1113C days versus the long-term average of 1135C days. The spring was very dry at 42% of normal rain and the combination of warm and dry early conditions precipitated an early bud burst, flowering and fruit set. The ideal flowering conditions created a potentially large crop that required significant fruit thinning at veraison. Because the dry conditions had dried out the topsoil, the vines tipped into the ripening phase quickly and completely at veraison, ensuring an early harvest of evenly ripened Pinot Noir grapes. Despite the thinning at veraison, the crop was 25% greater than average, elevated by a summer rainfall event in January. 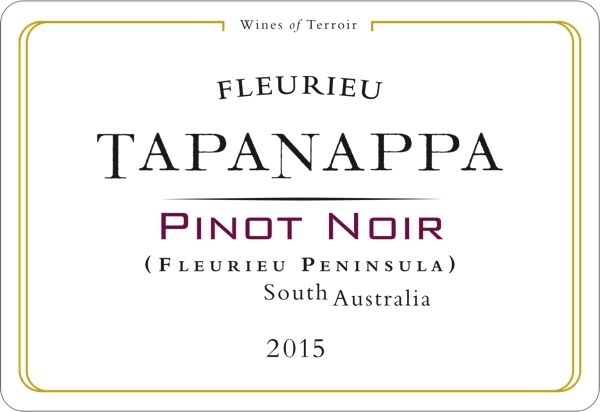 Tapanappa 2015 Fleurieu Peninsula Pinot Noir is a moderately coloured and delicate wine, the reflection of a cool season and more appropriately labeled as Fleurieu Peninsula Pinot Noir rather than the more concentrated wine expected of Foggy Hill single vineyard designation. The 2015 Tapanappa Fleurieu Peninsula Pinot Noir was harvested from the Foggy Hill Vineyard on the 4th and 5th of March. 30% of each clone and block of Foggy Hill Pinot Noir was hand harvested on the 4th of March into shallow trays and taken to the Tapanappa winery and chilled to 2C. The next day, the balance of fruit was also hand harvested. The cold whole bunch fruit was distributed into the bottom of the 0.9 tonne fermenters and then the same clone/block fruit was destemmed, crushed and chilled to 2C before being placed on top of the cold whole fruit. A cold maceration of 4 days in tub preceded the beginning of fermentation and daily hand plunging of the cap. After 12 days in fermentation tubs, the fermentation had finished and the tubs were sealed down for a further 9 days of maceration. The tubs were tipped into the new Willmes Merlin air bag press and drained and lightly pressed straight to French oak barriques (30% new). The young Pinot wine underwent malo-lactic fermentation on full lees before being racked and returned to barrique for a total of 12 months. The wine was clear racked and blended in April 2016 prior to bottling in July 2016.